Edmonds, a charming city of small shops lining main streets instead of huge malls, is located approximately 17 miles North of Seattle and 17 miles South of Everett. Puget Sound is its front yard with a fabulous view of the Olympic Mountains. Turn around, face East, and take in a breathtaking view of the Cascades and Mount Rainier. Voted “The Friendliest Town in Western Washington” nine years in a row, Edmonds is representative of small-town America. It contains only about nine square miles of land rea and five miles of shoreline. The town is renowned for an Underwater Park filled with an alluring display of sea life. Edmonds waterfront, near the ferry dock. Shopping’s fun here. Discover treasures from England, France, Scandinavia and Asia as you browse in bookstores, speciality shops and antique stores. Enjoy welcoming local merchants eager to please customers. Edmonds was well-known for its shingle mills until 1951 when the last mill closed. Today visitors like The Milltown Mall containing a historic building in the heart of downtown with a variety of shops in a city block. Edmonds Historical Museum is housed in a library built in 1910. History comes alive in this town. Due to the prominence of art in this fascinating place, Edmonds is known as the cultural bug of South Snohomish County. It has a professional ballet company, three ballet schools, a regional symphony, a youth orchestra and many artists’ cooperatives, clubs and guilds. The water front beckons with ferries taking passengers to the Kitsap Peninsula across the sound. The Port of Edmonds Marina is home for around 8000 vessels. Visitors rave about the natural beauty. Like the gorgeous Olympics, Cascades, Mount Rainier and Mount Baker is a delightful contrast to the glimmering waters of Puget Sound. 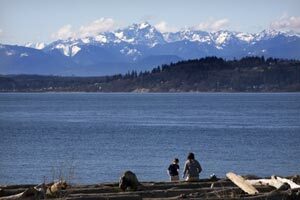 A great place to visit, live or retire, Edmonds has it all.